how lifestyle changes can significantly improve symptoms. In 2010, the National audit of continence care9 demonstrated a number of deficiencies in service provision and standardised assessment for people with UI in primary and secondary care, and care-home settings (see Box 1, below). Provision of training for healthcare workers to manage bladder and bowel problems is patchy across the nation, and overall occurs in less than 50% of acute hospitals. Quality of care (assessment, diagnosis and treatment) is worse in older people aged 65 years and over compared with those aged under 65 years. Following on from this, in September 2013, NICE issued Clinical Guideline (CG) 171 on: Urinary incontinence—the management of urinary incontinence in women.10 This guideline focused on diagnosis and treatment pathways, whether conservative, pharmacological, or surgical, for women with UI. NICE has now published Quality Standard (QS) 77 on: Urinary incontinence in women.11 The quality statements were developed bearing in mind the shortcomings illustrated in the National audit of continence care 2010 (see Box 1, above) and to encourage implementation of NICE CG171. NICE QS77 comprises seven statements, which are shown in Table 1 (see below). Women first presenting with UI have a physical examination, recording of the type and duration of symptoms, and categorisation of the urinary incontinence. Women first presenting with UI are asked to complete a bladder diary for a minimum of 3 days and given advice about the impact that lifestyle changes can have. Women with UI are only offered containment products as a temporary coping strategy, or as long-term management if treatment is unsuccessful. Women with stress or mixed UI who are able to contract their pelvic floor muscles are offered a trial of supervised pelvic floor muscle training of at least 3 months' duration as first-line treatment. Women with symptoms of urgency or mixed UI are offered bladder training for a minimum of 6 weeks as first-line treatment. Women with UI have indwelling urethral catheters for long-term treatment only if they have an assessment and discussion of the practicalities and potential urological complications. Women with overactive bladder or stress UI symptoms have a multidisciplinary team review before they are offered surgery or other invasive treatment. improvement in quality of life and experience of care for women with UI. The expectation is that assessment and management of UI in women is effective and standardised wherever the woman is seen. The clinical history should include the duration of onset and severity of the lower urinary tract symptoms (LUTS), a subjective assessment of the degree of bother associated with the symptoms, and specific questions around urgency and stress leakage of urine. As a minimum, physical examination should include palpation of the abdomen to look for gross abnormalities and inspection of the external genitalia. See Box 2, below for further information on the categorisation of UI. OAB is defined as urgency that occurs with or without urgency UI and usually with frequency and nocturia. OAB that occurs with incontinence is known as 'OAB wet'. OAB that occurs without incontinence is known as 'OAB dry'. These combinations of symptoms are suggestive of the urodynamic finding of detrusor overactivity, but can be the result of other forms of urethrovesical dysfunction. weight reduction in women who have UI and a body mass index greater than 30 kg/m2. Bladder training actively involves the woman trying to increase the interval between onset of the desire to pass urine and actually going to pass urine. Bladder retraining helps a woman to begin to hold more urine for longer periods of time. NICE website. NICE CG 171. Urinary incontinence: The management of urinary incontinence in women. NICE, 2013. Available at: www.nice.org.uk/guidance/cg171 Reproduced with permission. express a preference for this form of management as no other alternatives have been successful. assessment of any benefit of medication for OAB after 4 weeks of treatment will put additional pressure on primary care if established continence services within the community are not adequate. Urinary incontinence in women is a common and distressing condition. The costs of containment methods (e.g. absorbent pads) are high; in contrast, treatment of UI is cost effective. Treatment of UI is always cheaper than containment and effective treatment has potential direct and indirect health economic savings. The provision of primary care continence services and trained continence advisors is not uniform throughout the country; NICE QS77 may be used to improve and strengthen these services. The pressures on general practice to deliver the recommendations in the absence of sufficient local continence services will be difficult without support and training. The number of individuals referred to secondary care services and who have had full access to an MDT review. Women referred to secondary care for consideration of invasive treatment should have access to the opinion and advice of an MDT. Local formularies should identify cost-effective pharmacotherapies for the various syndromes covered in NICE QS77. CCGs=clinical commissioning groups; QS=quality standard. Chang C, Gonzalez C, Lau D, Sier H. Urinary incontinence and self-reported health among the U.S. Medicare managed care beneficiaries.J Aging Health 2008; 20 (4): 405–419. Senra C, Pereira M. Quality of life in women with urinary incontinence. Rev Assoc Med Bras 2015; 61 (2): 178–183. Brown J, Vittinghoff E, Wyman J et al. Urinary incontinence: does it increase risk for falls and fractures? J Am Geriatr Soc 2000; 48 (7): 721–725. Mody L, Juthani-Mehta M. Urinary tract infections in older women: a clinical review.JAMA 2014; 311 (8): 844–854. Mishra G, Barker M, Herber-Gast G, Hillard T. Depression and the incidence of urinary incontinence symptoms among young women: results from a prospective cohort study.Maturitas 2015; 81 (4): 456–461. Holroyd S. Incontinence-associated dermatitis: identification, prevention and care. Br J Nurs 2015; 24 (9): S37–38, S40–43. Kim S, Ward E, Dicianno B, et al; National Spina Bifida Patient Registry. Factors associated with pressure ulcers in individuals with spina bifida. Arch Phys Med Rehabil 2015;96 (8): 1435–1441.e1. MGP Ltd. 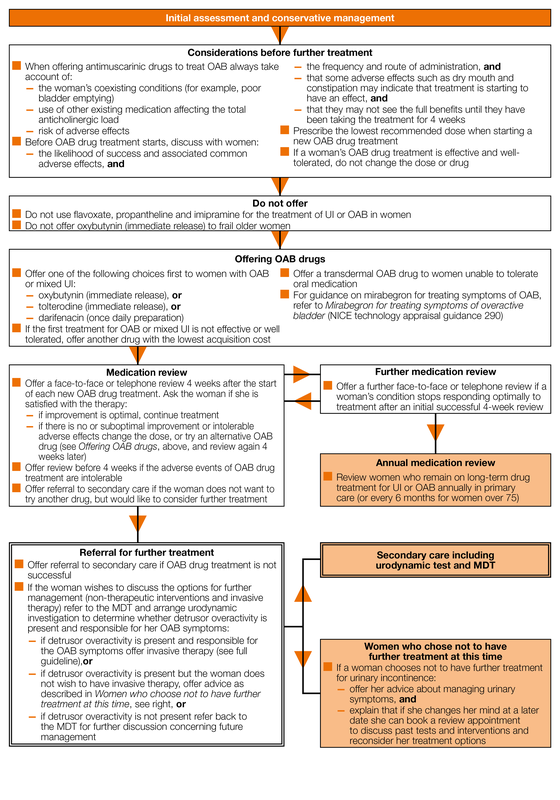 Initial advice and conservative treatments algorithm. Guidelines, November 2013. Available at: www.guidelines.co.uk/obstetrics_gynaecology_urology_nice_ui_women_nov13 (accessed 28 July 2015).